After five main games and a handful of spin-offs, it’s easy to get complacent with Disgaea‘s quirks and forget how much of an impact the original game had when it first came out in 2003. With the ability to throw characters around the map insane upper limits for every stat imaginable, Disgaea: Hour of Darkness was quite unlike any other tactical RPG of its day. It’s also the game that really put Nippon Ichi Software on the map (outside Japan, at least). Fifteen years later, Disgaea 1 Complete is a return to that iconic game, all polished up and ready for a new audience on a new console. As the “complete” part of the title suggests, it includes all the additions from the PSP and Nintendo DS releases—namely, an additional storyline and a handful of new characters to recruit—but the most significant change is the graphical overhaul. The original game already looked somewhat dated when it first released, with low-resolution sprites that lacked the crisp, clean qualities of modern pixel art, and a muted colour scheme that’s a far cry from the brightness of Nippon Ichi’s later fare. 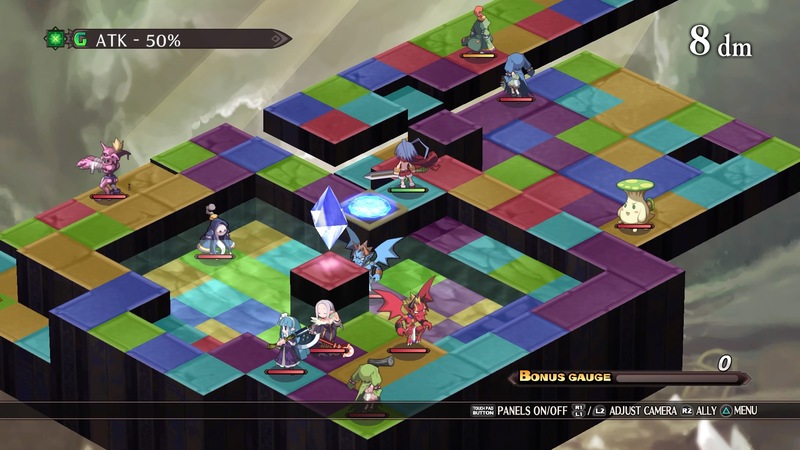 Disgaea 1 Complete brings the whole game into line with last year’s Disgaea 5: bright, colourful, high-resolution sprites, new character art, improved environmental textures, and a revamped user interface. The historian in me is ambivalent about the change (and I’d love it if the original form was preserved too, somehow), but it’s hard to argue that the new version isn’t far, far easier on the eyes. The new sprites look beautiful, and it’s worth taking a moment to put the eccentric action on hold for a moment and just admire them. They’re as cartoony as ever, but with cleaner, finer linework, more detail, and brighter colours. Beyond that, Disgaea 1 Complete is the same old Disgaea from 2003, with relatively less feature creep than we see in the later games, and that gets no complaints from me. It’s a tactical RPG (think Final Fantasy Tactics) that follows the hilarious efforts of demon prince Laharl to claim his rightful place as the ruler of the Netherworld, while other demons also vye for the throne and angels constantly interfere. To call it over-the-top would be an understatement; Disgaea 1 Complete takes its ridiculous premise to the endth degree, with hilarious results. At the heart of it all is a cast of brutish but oddly charming characters, from Laharl himself, with his juvenile bravado, to the angel-in-training Flonne, who’s naive to a fault. Between its jokes and just the sheer eccentricity of it all, the game had me laughing almost constantly. At the same time, there’s a thoughtful subtext to everything that goes on. Disgaea is largely built on the idea of swapping the typical roles of “good” and “evil” in games by casting you as an ambitious, heartless demon, and it uses that premise to question the very notions of “good” and “evil” as any sort of intrinsic, immutable quality. It’s not an overly deep or academic exploration of the matter, but it’s fascinating all the same. 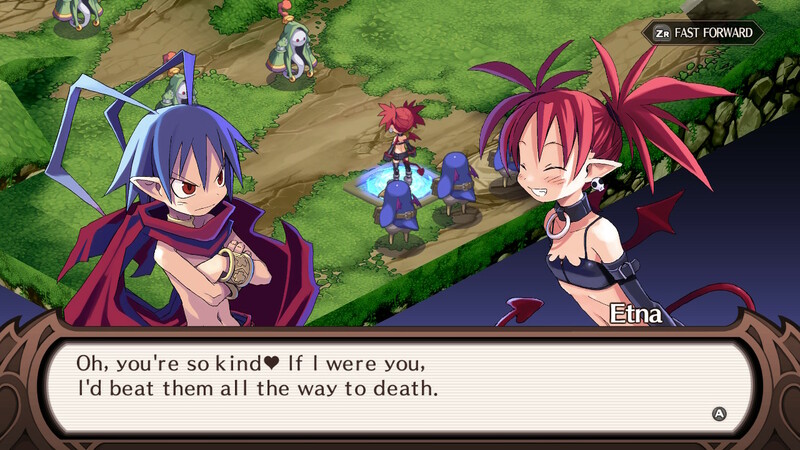 Disgaea 1 Complete‘s outrageousness carries over into the gameplay, too. One of the defining mechanics of the combat system the ability to pick up and throw characters. One unit can stand next to another, pick them up, and then throw them a set number of tiles in any straight line, which fundamentally messes with the genre’s typical grid-based mobility. A character’s movement limit isn’t set in stone when they can move as far as possible, then get picked up and thrown another few squares to reach a space they wouldn’t have been able to get. Likewise, throwing can be a shortcut to cross gaps and climb heights that would otherwise need you to spend at least a few turns circumventing. Throwing isn’t limited to one character at a time, either. You can pick up character after character, creating a tower of units, and then throw them one after the other to cross huge distances at once. You can throw enemies, too, to help get them into more useful or less dangerous positioning. 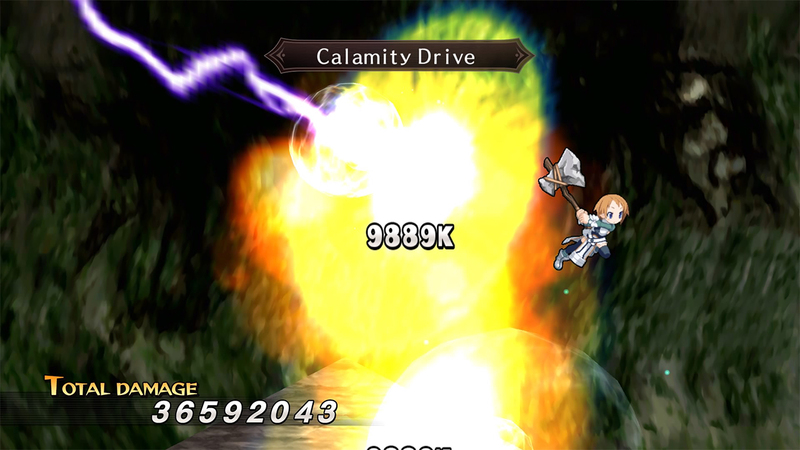 There are a few other little quirks to the combat system, like Geo Panels—which give certain buffs and debuffs to characters standing on marked squares—but throwing is the one thing that really pulls Disgaea in a new direction. 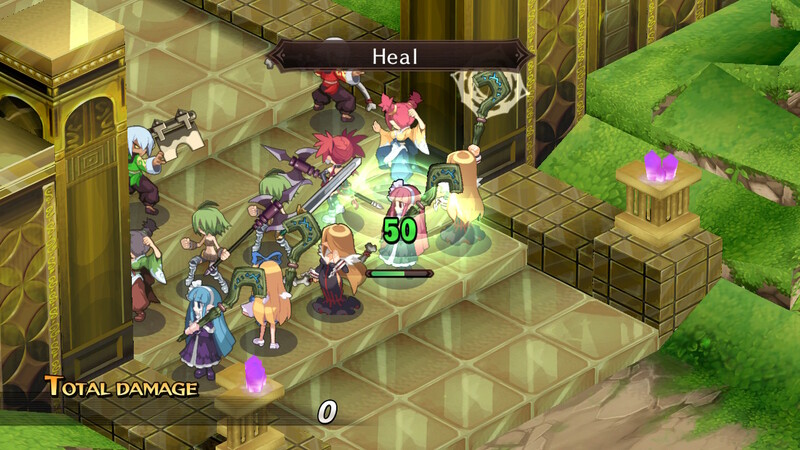 Much of Disgaea 1 Complete is spent outside combat, trying to perfect your squad of minions. There’s an extensive range of job classes and equipment available, and characters can learn skills from outside their class’ usual suite by summoning and fighting alongside pupils. With obscenely high stat caps (the level cap is 9999, and individual stats can get into the millions), there’s plenty of scope for min-maxing—so long as you have the time to dedicate to it. Equipment can be levelled up, too, which involves delving into a series of randomised dungeons that are, narratively speaking, contained within each item. Each new floor you reach increases the item’s level, and by finding and defeating certain characters within these item worlds, they’ll take residence inside, further increasing specific stats. The flipside of this is that, yes, Disgaea 1 Complete puts a lot of emphasis on grinding. This isn’t an inherently bad thing, and the process of levelling up different units, learning new skills, and unlocking new job classes is one that’s intrinsically rewarding. At the same time, the difficulty of the main story missions is such that you’ll need to spend at least a little bit of time grinding between each new chapter, which can be a chore if you just want to play through and see the story to its conclusion. Being on Switch certainly helps with that, though. Levelling up is a great way to spend a train ride, or to do while watching your favourite comfort TV, or before going to bed. This isn’t the first time Disgaea‘s been on a handheld, but it still makes a huge difference in keeping the inconvenience of the level grind to a minimum. 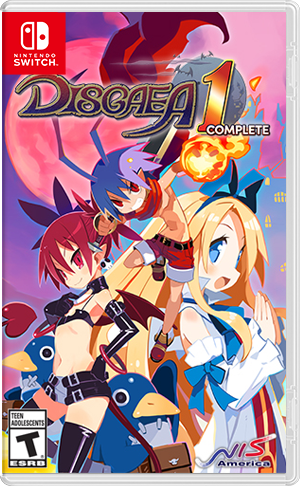 Whether or not you’ve played the original, Disgaea 1 Complete is essential for anyone who likes tactical RPGS, or JRPGs in general. The visual overhaul is impressive enough to make it feel like a brand new game, and for newcomers, it’s the perfect introduction to a series whose later games can be somewhat unapproachable. So long as you’ve got the time to commit to it, Disgaea 1 Complete is a wonderful experience.